We are proud and excited to introduce NRA Certified Instructor, Marine Corp Veteran, and Shift Commander for the Public Safety Dept. 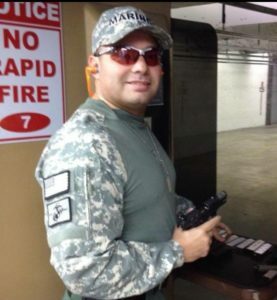 UM campus, Carlos Lopez as head of COBRA Defense Miami’s tactical firear m training division. Carlos is a Marine trained expert in rifle and pistol and saw combative action in Beirut, Lebanon. Additionally, as a U.S. Marine Corps Sergeant/ Squad Leader, he provided security at the American Embassy, maintained the combat readiness of his squad, and provided security forces at Rodman Naval Station. He is uniquely qualified to introduce you to firearms training and safety as per NRA guidelines and teaches the required Florida state course for the issuance of your Concealed Weapons Permit (CWP). We offer this course in both group format and private training. Our Concealed Weapons Permit course follows NRA guidelines and includes both classroom instruction, safety procedures, and supervised safe shooting at the range. You may use your personal firearm for the range portion or we provide one for you. Beginners and experienced shooters are welcome. BONUS: Register for any Cobra Defense 10 Week Reality Based Self Defense Academy and receive the Concealed Weapons Permit course FREE! For more information on course dates or to schedule your private Concealed Weapons Permit course please call 800-289-8188.